'It is a win-win situation for both countries and the future look promising,' says Rajaram Panda, the Indian Council for Cultural Relations India Chair Visiting Professor at Reitaku University, Japan. 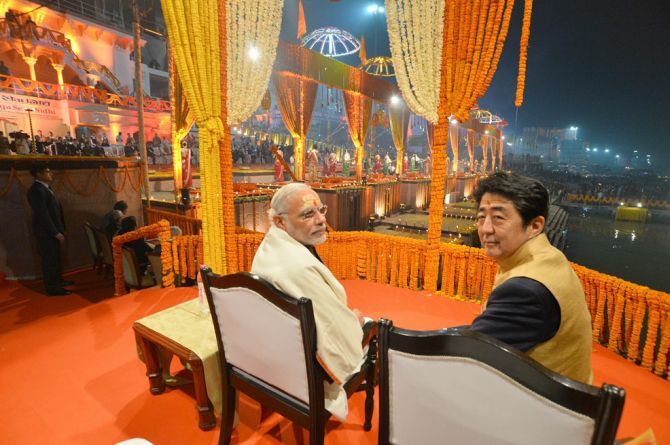 IMAGE: December 2015: Prime Minister Narendra D Modi and his Japanese counterpart Abe Shinzo at the Ganga Aarti at the Dashashwamedh Ghat in Varanasi. India-Japan ties are destined to scale another height with Japan's Prime Minister Abe Shinzo landing in India on September 13 for a summit meeting with his counterpart Prime Minister Narendra D Modi. Watchers of India-Japan relations are well familiar with the kind of bonhomie that the two leaders have built, which helped in signing a deal on a sensitive issue such as civil nuclear cooperation. Like on earlier occasions, this time too the two leaders are likely to discuss a range of issues, including defence, the Asia-Pacific, nuclear cooperation, and joint development of projects. Both leaders are likely also to review the recent progress in the multi-faceted cooperation between the two countries under the framework of their Special Strategic and Global Partnership. 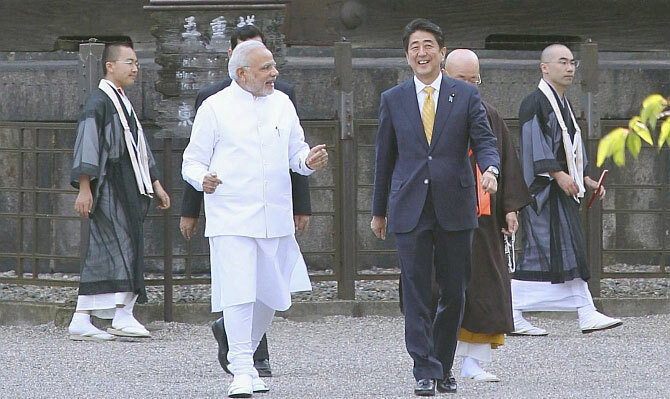 This will be the 12th India-Japan Annual Summit since it started in 2006 and the fourth between Modi and Abe. Unlike most bilateral summits that are held in New Delhi, this time Modi will host Abe in Gandhinagar, the second time for such a meeting in the city, the first being Modi meeting Chinese President Xi Jinping in September 2014. Interestingly, when Modi was hosting Xi on the banks of the Sabarmati river, an India-Chinese standoff was going on in Chumar. This time, Modi meets Abe, the first foreign leader visiting India three weeks after the disengagement of Indian and Chinese troops at Doklam. The significance of Modi's style of conducting diplomacy cannot be lost sight of. It needs to be remembered that Japan was the only major country that conveyed its unequivocal support to India and Bhutan through diplomatic channels during the Doklam standoff. Japan's Ambassador to India Kenji Hiramatsu had then observed that the 'parties involved do not resort to unilateral attempts to change the status quo by force (but) resolve the dispute in a peaceful manner'. It is relevant to examine the likely takeaway that could emerge from the summit. Given the manner bilateral ties have progressed over the decade or so, the focus is likely to be on economic, defence/maritime security, and cooperation on regional issues, in each of which both countries have identified mutual benefits and share common viewpoints. 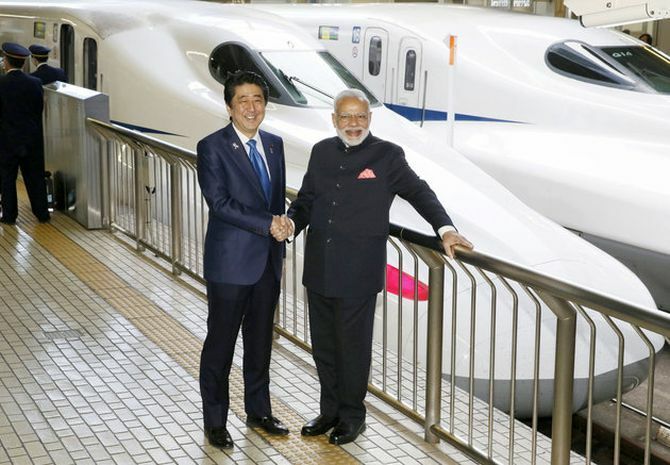 IMAGE: November 2016: Modi and Abe aboard Japan's high-speed Shinkansen bullet train. Economic: Abe taking part in the ground-breaking ceremony (bhoomi pujan) for the ambitious Mumbai-Ahmedabad High Speed Rail Project or the Shinkansen (bullet train) project on September 14, is likely to hog the limelight of the visit. The ceremony will be held at a site near the Sabarmati railway station. 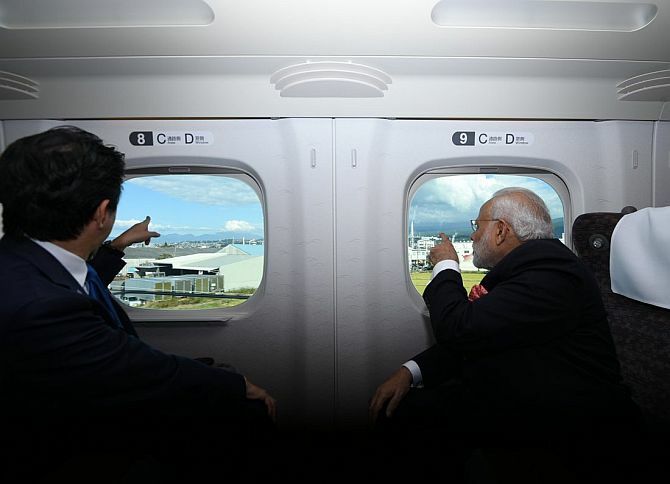 When Modi visited Japan in November 2016, Abe travelled with him from Tokyo to Kobe by Shinkansen to visit a bullet train plant at Kawasaki Heavy Industries Ltd, a maker of Shinkansen cars. During Modi's earlier visit in September 2014, Abe was in Kyoto to receive him. In turn when Abe visited India in 2015, Modi traveled with him to Varanasi and witnessed the Ganga Aarti at the Dashashwamedh Ghat. Besides visiting the Sabarmati Ashram, Mahatma Gandhi's abode, both leaders will also visit the 16th century mosque in the old city -- Sidi Saiyad -- known for its iconic window filigree work synonymous with Ahmedabad. A closed door meeting over dinner at a heritage hotel -- the House of Mangaldas -- next to the mosque is also on the schedule. Why is the Shinkansen project so important for India? Improving infrastructure facilities and connectivity is directly linked with the Modi government's 'Make in India' priority, thereby putting the economic growth strategy on a fast track. As much as 80% of the Rs 1.08 lakh crore soft loan is being funded by the Japan International Cooperation Agency at a nominal interest rate of 0.1 per cent, with a moratorium on repayments up to 15 years in a total repayment duration of 50 years. The MoU for this 508-km corridor was inked between JICA and India's railways ministry. Two-thirds of this project is expected to fall within Gujarat. The train will have the capacity to accommodate 750 people and is expected to reduce travel time between the two cities from seven to roughly three hours. The project is expected to be completed by 2022, a year ahead of its earlier plan of 2023, to coincide with 75 years of India's Independence. The train will have a dozen stops and travel at an operational speed of 320 km per hour. The corridor will also have a 21-km long tunnel between Boisar and the Bandra Kurla Complex in Mumbai, of which 7 km will be under the sea. When operational, this project will be the first of many other projects that will revolutionalise rail connectivity in the country. The project is part of the Modi government's 'Make in India' initiative, under which units to manufacture rolling stock and other components will be set up in India with Japanese partnership. Given that POSCO's steel mill project in Odisha is stuck on the land acquisition issue though the MoU was signed in 2005, India needs to delicately handle and resolve the land acquisition issue, for which strong political decisions are needed. In the initial phase, the technology and equipment will be sourced from Japan and a technology transfer is envisaged later. India aims to develop indigenous technology with the help of Japan that will pave the way to expand high-speed networks connecting all major cities. In the long term, India also aspires to export this cost-efficient technology to the world. With the hope that the project will reach economies of scale in quick time, the government has already started conducting studies for high-speed rail corridors connecting Delhi-Nagpur, Nagpur-Mumbai, Delhi-Chandigarh, among others. A special purpose vehicle, the National High Speed Railways Corporation, has been set up to undertake all high-speed train projects in the county. This shows Japan will remain an important partner in India's ambitious plans to develop infrastructure and improve connectivity. Even in this Shinkansen project, China sees Japan as a competitor and is vying to upstage Japan from other future projects in India. Both countries have been competing to bag high-speed rail contracts in the region. China beat Japan in 2016 to bag a project in Indonesia and both countries are locked in a contest for the Singapore-Kuala Lumpur high-speed rail. Thailand has signed two contracts with Chinese state enterprises for la high-speed rail project. Japanese trains are considered costlier but safer, but China is considered to have better expertise in building in challenging conditions. What goes in Japan's favour is that its sales pitch around quality. Its network boasts a record of zero fatal accidents in its more than half a century history. The initial higher costs of Japanese trains are offset by lower repair expenses and this is a factor that makes Japanese trains preferred in India. Both leaders are also expected to sign multiple economic deals and launch projects, including the Rs 3,000 crore (Rs 30 billion) Suzuki car manufacturing plant at Hansalpur, about 170 km from Ahmedabad. Another big-ticket project is the Rs 1,000 crore (Rs 10 billion) Honda motorcycle and scooter project in Gujarat. Though trade has remained at a low key and the full potential is yet to be realised, Japanese investment in India has registered steady growth. Japan is now the third biggest investor in India, with cumulative funding of $25.67 billion from 2000 to 2017, constituting 8% of foreign investments in India during that period. Gujarat is at the forefront of Japanese investments, with inflows increasing 50% to $3.36 billion in 2016-2017 from $2.24 billion in 2015-2016. Political: At the political domain, there is a growing convergence of views between the two countries. This has the capacity to drive Asia's economy and development and stimulate global growth. Close cooperation between India and Japan would facilitate connectivity, infrastructure and capacity-building in the regions that occupy the inter-linked waters of the Indo-Pacific. Seen from this perspective, the Modi-Abe summit assumes significance as it comes amid rising tension in the region following the sixth nuclear test by North Korea and China's growing assertiveness in the South China Sea. 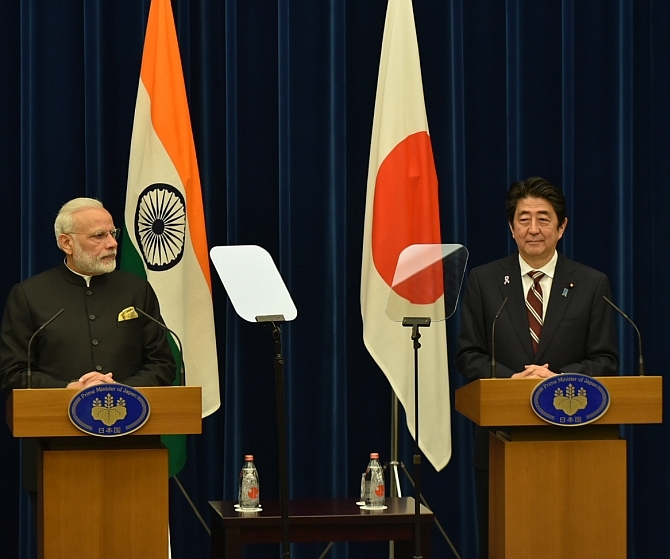 Deepening cooperation on maritime security in order to secure maritime commerce impinging in many countries' economic growth is another area both Modi and Abe are expected to discuss. A possible maritime security pact could be on the agenda. China's growing activities in the East and South China Seas and the Indian Ocean are matters of concern. Both nations are expected to discuss how to help strengthen capacity building with Vietnam, Singapore, Australia, and others in Southeast Asia with whom they share common concerns and viewpoints. Japan has agreed to supply military technology to India, thereby demonstrating the high level of confidence that the two countries have developed with each other. As the world is turning increasingly uncertain with China's questionable conduct in regional activities and North Korea's nuclear tests and missile launches, Japan and India look forward to work together for a collaborative future. Greater cooperation between the two nations shall contribute to peace and security in the region with significant implications for the world. IMAGE: Japan was the only major country that conveyed its unequivocal support to India and Bhutan through diplomatic channels during the Doklam standoff. Nuclear: Sustained negotiation was needed to clinch a deal on cooperation in civil nuclear energy in November 2016 during Modi's visit to Japan. Modi and Abe signed an MoU for civil nuclear cooperation in December 2015 during Abe's visit to India for the annual bilateral summit overcoming reservations over India's nuclear status. Given the anti-nuclear sentiment in Japan, strengthened further by the Fukushima nuclear accident, a civil nuclear deal between Japan and a non-NPT signatory India looked difficult. The fact that an agreement was finally reached on this reflected the growing trust both share and the depth of their strategic partnership. It became operationalised in July when the Japanese Diet (parliament) passed the agreement, with India's Foreign Secretary Dr S Jaishankar and Japan's Ambassador Hiramatsu exchanging diplomatic notes. In fact, cooperation in civil nuclear energy and defence are the two domains that portend the future direction of bilateral ties. Japan can now export nuclear power plant technology as well as provide finance for nuclear power plants in India. 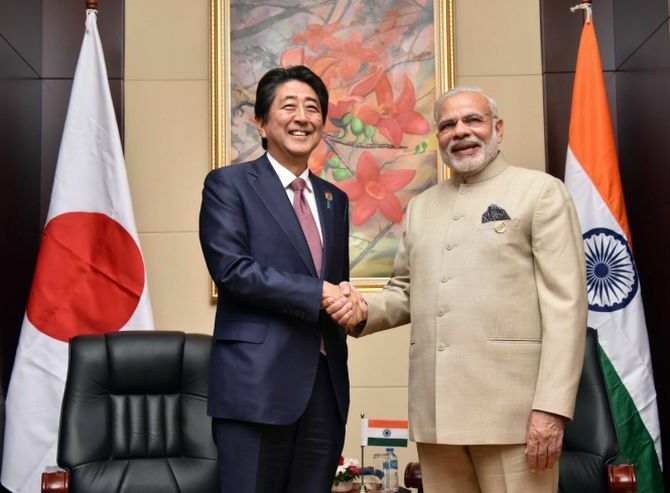 Japan has expertise in nuclear waste management and has agreed to assist India. Japan is also likely to undertake joint manufacture of nuclear power plant components under the Make in India initiative. In the coming years, civil nuclear ties will prominently feature as a key element in the strategic partnership between the two countries. Japanese conglomerate Toshiba, which owns US-based Westinghouse, will have a major role when the US nuclear firms supplies technologies for the set of six reactors in Andhra Pradesh following its bankruptcy. While Westinghouse will supply the technology, construction will be undertaken by an Indian partner. This could not have been possible without a nuclear deal with Japan. Westinghouse was acquired by Toshiba in 2006 for $5.4 billion. Hitachi, another Japanese firm, has a stake in GE, which also proposes to set up reactors in India. In the field of nuclear energy, India successfully leapfrogged three fronts in 2017 itself: First clinching pacts with Russia for Units 5 and 6 at the Kudankulam Nuclear Power Plant, followed by the first uranium shipment from Australia, and then the operationalisation of the deal with Japan. So, the government's goal to enhance nuclear power generation in India is on track. India has chosen nuclear energy as it is clean and plans to increase its share in its total energy mix. At present, the share of nuclear energy as a source is less than 2 per cent. The nuclear deal with Japan will facilitate the increase in this share. Critics may say nuclear energy is expensive when world oil prices have fallen and solar rates are declining. But what makes nuclear energy a preferred alternative is that it remains the world's most viable source of carbon-free base-load power. This makes India-Japan civil nuclear cooperation important, at a time when India's energy demands continue to soar. IMAGE: September 2017: Modi and Abe will take part in an 8 km-long roadshow in Ahmedabad on September 13. The road show will begin at Ahmedabad airport and end at Mahatma Gandhi's Sabarmati Ashram. Space Cooperation: Both countries are also exploring cooperation in the field of space, including a mission to the moon. Modi and Abe are likely to deliberate on this issue. TeamIndus, a Bengaluru-based private aerospace company, has joined hands with Japan to launch India's first private spacecraft to the moon in March 2018. Thus far, only the US, Russia and China have achieved such a feat. The space partnership shall serve as a plank in the efforts to present a counter to China. By building a partnership with Japan, India needs to seize this opportunity to spring into a bigger role in the global arena. Asia-Africa Growth Corridor: Both India and Japan are on the same page to cooperate in the economic development of Africa. Expanding bilateral cooperation and going beyond by seeking synergy in the Asia-Africa growth corridor shall have a global footprint and contribute to the world's economic growth. A vision document regarding the Asia-Africa Growth Corridor has already been released by both governments on the sidelines of an African Development Bank meeting in Gandhinagar. Both India and Japan have complementary strengths and building a partnership for the development of Africa makes both political and economic sense. All the above, and many more, provide the opportunity for India-Japan bonhomie to growing stronger and deeper. Modi and Abe are working seriously to achieve this objective. It is a win-win situation for both and the future look promising. The views expressed are Rajaram Panda's own and do not represent either of the ICCR or the Government of India. Is India losing its key ally?